With just under 6 million inhabitants in an area of only 700 square kilometers, Singapore is the third most densely populated country in the world. Despite the tight working quarters, the Herrenknecht EPB Shield S-975 bored two 1,000-m long drainage tunnels there. The final breakthrough took place in December 2017. The new tunnels expand the existing drainage system and will relieve the Singapore River long-term, for example during heavy rain. This greatly reduces the risk of flooding in the city-state. In the very heart of Singapore, the twin tunnels complement the existing 5-km long Stamford Canal. Due to the inner-city location, the smallest possible diameter of 24 m was chosen for the round launch shaft. Because of the limited space, attention was paid in the design phase to making the machine as compact as possible. The individual parts of the EPB Shield arrived just-in-time at the jobsite. Carefully, the Herrenknecht engineers gently lowered the TBM component by component into the launch shaft until it was ready for its tunnel mission. On completion of the first tunnel, the machine was returned to its starting point in the launch shaft, where it began excavation of the second tunnel tube. With a drive power of 630 kilowatts, the TBM worked its way through complex ground conditions (highly weathered granite) and with small overburdens crossed under the busy inner city of the metropolis of Singapore, surrounded by skyscrapers with shopping malls and apartments. In 2010 and 2011 Orchard Road, which runs near the Stamford Canal, was repeatedly affected by major flooding because the existing drain could not accommodate the water masses during heavy rain and flash floods. In recent years, rains have become heavier and floods in Singapore more frequent, reports the National Water Agency. The expansion of the drainage system is designed to prevent this in future and relieve the Stamford Canal by up to 30 percent. 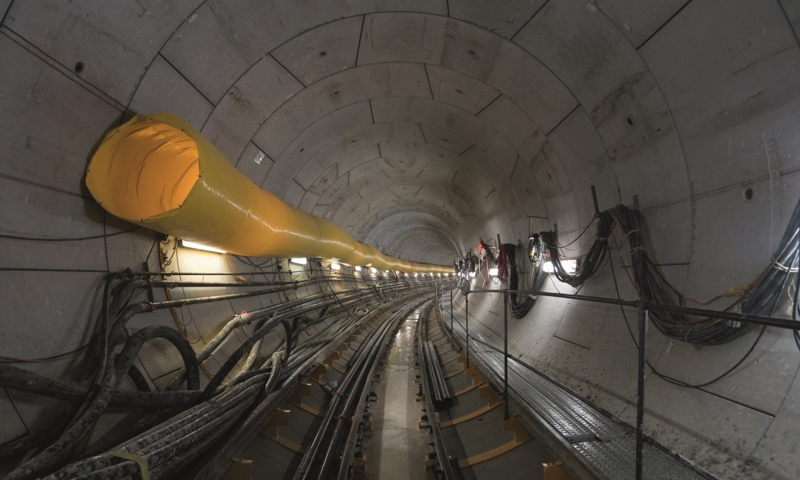 Additional challenges were posed by the short distance between the two tunnels and a tight curve radius of 180 m in the course of the alignment. Precision and intricate work were called for here: with shield articulation cylinders, the curve drive was continuously adjusted so that deviations were always within the tolerance. In this way a continuous advance with top performances of up to 18 m per day and 91 m per week was possible. The site crew of customer Tiong Seng Contractors (Pte) Ltd did an excellent job.